Save birds this summer - with each trip to the beach! Like birds? Like the beach? We have just the opportunity for you! The Timucuan Shorebird Partnership is looking for bird stewards to help our imperiled shorebirds nest safely? Join us for our orientation and training at the Ribault Club on May 4th, from 10 AM to 12 PM. All you need are a few hours to spend at nesting sites and a desire to help the public share the beach responsibly with our feathered friends. RSVP to Chris Farrell at cfarrell@audubon.org for more details about our informative and fun training session. Duval Audubon Society is partnering with St. Johns Riverkeeper and the City of Jacksonville to do monthly cleanups in the Jacksonville area, and this month’s cleanup will be at Sheffield Regional Park. Sheffield Regional Park is about 385 acres with nature trails and several lakes. There are open fields, wooded areas, and multiple lakes and ponds, and with so many different habitats, it is a haven for many different species of birds and other wildlife. In honor of Mother's Day, our theme for this event will be "Taking Care of Mother Earth." Let's honor our Mother Earth and help prevent trash from entering our waterways and endangering our beloved wildlife. Wear clothes that can get dirty and boots or close-toed shoes (for your safety, no sandals or flip-flops, please). Bags, gloves, and grabbers will be provided. Location: Sheffield Regional Park, 3659 New Berlin Rd, Jacksonville, FL 32226. Meet in the second parking lot near the picnic pavilion. Duval Audubon Society is an all-volunteer organization, and we need YOUR help to accomplish our mission, "Connecting people with nature." Our dedicated volunteer board members work hard throughout the year to offer outstanding field trips and fascinating programs to the community. We also provide monthly beginning bird walks as well as opportunities to participate in community enhancement activities such as cleanups at area parks and shorebird stewarding at the beach. We have also presented informational programs to schools and community groups, and, when we can, represent the organization at festivals and events throughout the area to spread the word about conservation and the importance of birds and other wildlife. Training will be provided for all of the above activities as needed. May Program, May 21, 2018, 6:30 p.m. to 8:30 p.m.
It’s our turn to shine. If you would like to share photographs you've taken this year of birds, you are in luck! It’s show and tell time at Duval Audubon. This is always one of our favorite programs each year. If bringing digital, please store the photos on a jump drive and don't forget to call ahead to reserve your spot for sharing your images - Contact Deb Kainauskas 904-254-0154. No photos? No problem. Just bring a potluck dish to share with everyone and enjoy the show. Come for a fun, casual evening! 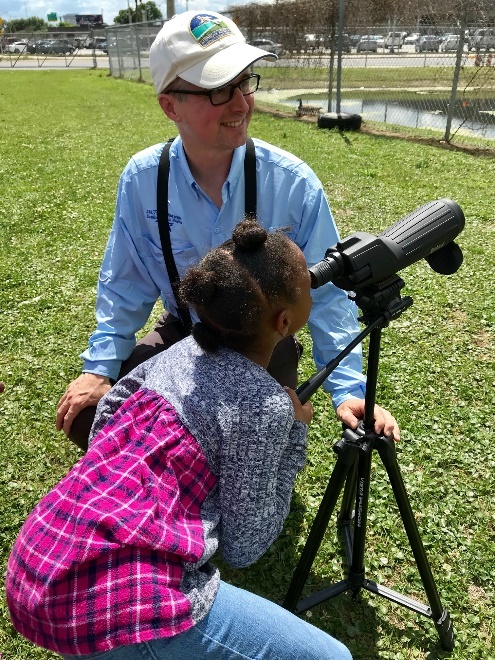 Duval Audubon Society board member Brett Moyer recently visited John E. Ford Elementary to share his love of birds and nature. He showed the students different kinds of birds that they might find in their own backyard, and brought several of the Audubon Society North American Birds plush toys to engage the eyes and ears of the sutdents. After squeezing the toy Northern Cardinal to play its song, a few of the students perked up and said, "Hey, I hear that in the morning outside my house!" Upon hearing the Eastern Towhee song, the students agreed that it sounded like "Drink your tea!" They also demonstrated why birders consider that phrase such a useful mnemonic device when, half as hour later, the students were able to remember and sing, "Drink your tea-ee-ee-ee-ee-ee!" when asked what the towhee sounds like. Students also enjoyed watching the live stream video of an Eastern Bluebird nest box that Brett set up this season where he teaches at the Bolles School in a collaboration with the Florida Bluebird Society. Students saw two eggs in the nest on the classroom screen. Then students excitedly pointed to the screen when the female bluebird, as if on cue, returned to the nest box and was visible fussing with her nest and adjusting her eggs. The kids loved the classroom presentation, but the cookie cutter bird seed feeders they made with a mixture of bird seed and gelatin really wowed them. There is nothing like a hands on activity--and messy can be even better--to engage a youngster. The children got to take the bird seed shapes home for their neighborhood birds to enjoy. After the classroom presentation and activity, Dr. Moyer took the class outside for some birdwatching. They had a chance to look through his spotting scope at some Laughing Gulls hanging out on campus. One student remarked, "The bird look SOO BIG when you look through that thing." Instilling an appreciation for birds and nature from an early age is critical for creating our next generation of environmental advocates, and is one of the ways Duval Audubon Society accomplishes our mission, "Connecting people with nature." For the May Field Trip Information, please check our Activities, Field Trips.